If your puppy fears riding in the car, it can be a hassle to travel with it, even to bring it along on errands. Some puppies throw fits, cry, and even get sick on the drive. Learn what you can do to ease those fears so your new dog will grow into an excellent traveling companion at home and away. While some pets look forward to car rides, it's understandable why some develop a fear of these trips. Many car rides end up at the veterinarian for vaccinations and unpleasantly cold thermometers inserted in uncomfortable places. You may want to comfort your frightened pet, but take care not to imitate the sounds your dog is making. When you make what you think are soothing, sympathetic sounds, it can sound to your dog like its own whining. You could be reinforcing that car rides are uncomfortable and scary, even for humans, and giving your puppy justification to continue fussing. Associate cars with fun, happy experiences instead of just trips to the vet. This process, called desensitization, takes patience and time, but it works whether a pet acts scared, sick, or just hyper. Once your puppy realizes a car ride means wonderful things, it will look forward to every trip. For a very frightened pup, set its food bowl near the car, and allow it to enjoy a meal. After several days when it's used to that, leave the car door open and feed the dog in the back seat if you're comfortable with that. In between feeding times, throw non-messy treats in the open car door for the pup to find. Your dog should learn good things in life happen when you’re near the car. Try playing a game or doing tricks in the vicinity of the car. If you leave the car doors open and the dog climbs in, don't make a big fuss, just continue the game like it's no big deal. Be sure the car is safely parked, away from the street and with the parking brake on. Never play games in the street or with a moving car. When your pup’s eating or otherwise distracted in the back seat, get in the front seat behind the steering wheel. Just sit there for a while like it's no big deal, then get out, so it understands nothing scary happens when you’re in the car too. Do this for one day. The next day when you’re behind the wheel and your puppy’s munching treats in the back seat, start the car. Then turn off the motor and get out without going anywhere. Do this three or four times during the day until the pet takes it as a matter of course. Finally, after you start the car, back the car to the end of the driveway and stop. Do this two or three times in a row, always letting the pet out after you return. If the puppy whines, paces, or shows stress, you may be moving too fast for it. The process takes a while, but it works. Continue increasing the car-time by increments—a trip around the block and then home, then a trip to the nearest fun place like the park before returning home. Go somewhere you know your dog will enjoy. Make every car trip upbeat and positive so the experience makes the dog look forward to the next trip. It’s a good idea to crate train and confine your puppy while in the moving car. A loose animal inside the car can be dangerous both to the pet and the driver. Invest in a seat belt, car barrier, or a kennel. Puppies can be crushed by deploying airbags, so keep them in the back seat. Many accidents have happened when a dog gets underfoot and the driver can't use the brakes or accelerator appropriately. Above all, a dog in the front seat is a distraction, and you need to keep your attention on your driving. Once your dog is too big to fit in a car-size crate, consider installing a gated barrier or fit the dog with a harness, using the seatbelt for safety. While your dog may not like this at first, it is the safest thing for the long run. 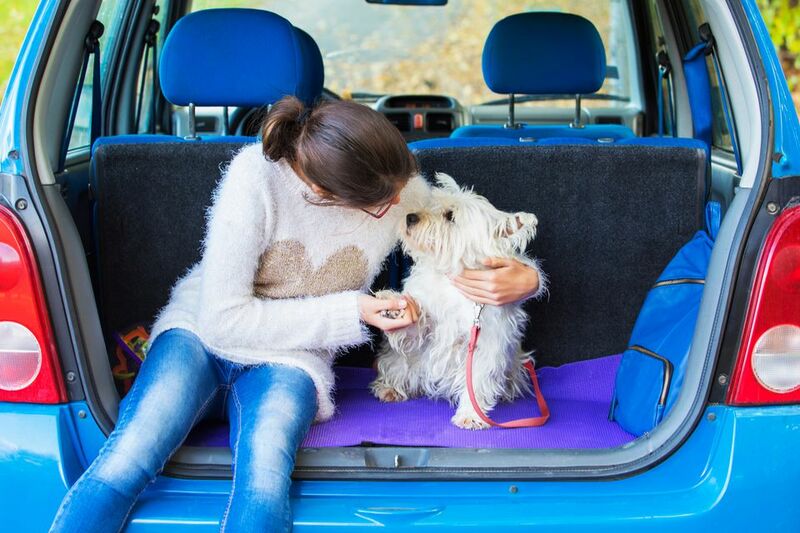 By ensuring that most of your car trips are to destinations your dog will enjoy, you can gradually ease your dog's fears. With persistence, you can have a pet who not only tolerates car rides but eagerly looks forward to them.